The term “ben tu hua” 本土化 , as used on Taiwan today, denotes “nativization” or “nativized,” depending upon its context. But that is merely its surface meaning. KMT party leaders must have the guts to categorically reject ben tu hua for what it is, self-hating anti-Chinese racism. Some 藍皮綠骨 “blue skinned, green boned” opportunists have been demanding that KMT leaders follow in the Pan Green camp’s ben tu hua footsteps. Their myopia has led them to ignore a number of simple realities. If a democratic majority on Taiwan wanted the KMT to go down the Pan Green ben tu path, why have wave upon wave of protesters representing the Pan Blue majority taken to the the streets, waving ROC flags, wearing brightly colored Chinese Red shirts, angrily demanding that Pan Blue leaders topple the ben tu hua DPP government? If a democratic majority on Taiwan wanted the KMT to go down the Pan Green ben tu path, why do scientific polls conducted in 2005 indicate that Lien Chan, high profile champion of Chinese reunification, was the second most popular political figure on the island, even though he was retired and out of the picture? If a democratic majority on Taiwan wanted the KMT to go down the Pan Green ben tu hua path, why are the ben tu hua DPP and the even more ben tu hua TSU on the brink of dissolution, while the non ben tu hua KMT gaining popular support and gathering political momentum, despite its often exasperating ineptitude? 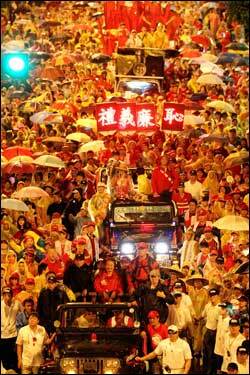 Could it be that a democratic majority of voters on Taiwan don’t want the KMT to go down the Pan Green ben tu path? Could it be that a democratic majority of voters on Taiwan want the KMT to go down a diametrically opposite path, the Deep Blue 大中國主義 “Greater China” path? Before we go any further, let’s make one point perfectly clear. The term ben tu hua, as used on Taiwan today, does not mean voting for political candidates who were born on Taiwan. The term ben tu hua, as used on Taiwan today, does not mean increasing the number of government officials who were born on Taiwan. Voting for political candidates who were born on Taiwan is perfectly fine. Increasing the number of government officials who were born on Taiwan is perfectly fine. No, the term ben tu hua means something else entirely. The term ben tu hua, i.e., nativization or localization, as used on Taiwan today, means the promotion of a self-hating “Taiwanese, not Chinese” ethnic consciousness, as groundwork for the founding of an anti-Chinese puppet regime and forward base to “contain” the Chinese motherland. The term ben tu hua or nativization is not an ordinary word in either the Chinese or English language. The term ben tu hua is a code word. 1. A secret word or phrase used as a code name or password. 2. A euphemism: “The Democrats’ ‘populism’ is a code word for bigger farm subsidies and protectionism” (New Republic). Obviously “euphemism,” the second definition from both reference sources, is the one relevant to our discussion. The term ben tu hua, as used on Taiwan today, has two meanings. The first meaning, the surface meaning, is a sugar coating. The second meaning, the underlying meaning, is the poison pill within. The surface meaning, the sugar coating, legitimizes ben tu hua among politically unsophisticated voters for whom the nuances of Orwellian Newspeak go right over their heads. Is it wrong to vote for political candidates who were born on Taiwan? Of course not. Is it wrong to increase the number of government officials who were born on Taiwan? Of course not. Is ben tu hua a righteous and worthy goal? Of course not. Because ben tu hua is a code word. Because ben tu hua is a euphemism. Because the real meaning of ben tu hua has nothing to do with voting for political candidates who were born on Taiwan or increasing the number of government officials who were born on Taiwan. The real meaning of ben tu hua, the underlying meaning, the poison pill within, has to do with indoctrinating the Chinese people on Taiwan with a self-hating “Taiwanese, not Chinese” ethnic consciousness, in preparation for eventual political secession. Pan Blue leaders cannot afford to be so naive as to presume that the term ben tu hua means what it appears to mean. If Pan Blue leaders insist on being that naive, that gullible, that literal minded, they will find themselves reduced to puppets dangling at the end of Pan Green strings. Pan Blue leaders, whenever they go up against Pan Green propagandists, must expose ben tu hua for what it is, hatred of their mainland compatriots’ Chinese-ness, and what’s even sadder, hatred of the Pan Green propagandists’ own Chinese-ness. Pan Green propagandists have attempted to force Pan Blue leaders to kneel before the Pan Green camp’s ben tu hua idol. Due to endemic Pan Blue self-doubt, Pan Green propagandists have enjoyed considerably more success than they deserve. This must not go on. This must change. Instead of retreating before Pan Green Political Correctness, Pan Blue leaders must counterattack. The KMT must realize it will never be as ben tu hua as any of the Pan Green parties. Even more importantly, the KMT must realize that ben tu hua is not something the KMT should strive for in the first place. Despite appearances, the DPP’s ben tu hua plank in its political platform is not an asset, it is an albatross around the DPP’s neck. Not only is ben tu hua morally contemptible, in an increasingly globalized economy, it is economically suicidal. Any short term political gain the KMT might derive from adopting the DPP’s ben tu hua policy would be nullified by the fact that ben tu hua has no place in the emerging global economy. Pan Blue leaders need to see past any panicky urge to outdo the Pan Green camp in pandering to ben tu hua mob sentiment. Pan Blue leaders shouldn’t even try to turn themselves into watered-down versions of ben tu hua Pan Green demagogues. Pan Blue leaders need to be what their political label suggests, unapologetic champions of Sun Yat-sen’s goal of national unity in the short term, and the Brotherhood of Man 天下為公 in the long term..
Pan Blue leaders need to affirm their own Pan Blue ideals. They need to turn Pan Blue ideals into the Conventional Wisdom on Taiwan. They need to compel Pan Green Quislings to dance to the Pan Blue tune.